3D city modelling allows us to build an accurate digital representation of an entire city, granting greater precision to project planning. Far more than a representation of the buildings, the technology also reflects the realities of that environment – such as mapping where new flood defences will be placed for Leeds City Council, UK to protect thousands of homes and businesses. By providing a platform for collaboration, changes can be added by experts and fed back on by other engineers, designers, city councils and city planners, so that everyone works from the same blueprint. Our technology brings together a vast amount of information to share one coherent story with everyone involved, enabling more expedient and accurate future planning. The animated video below of central Manchester’s NOMA development, shows the immersive power of 3D mapping to bring to life a proposed future in detail. 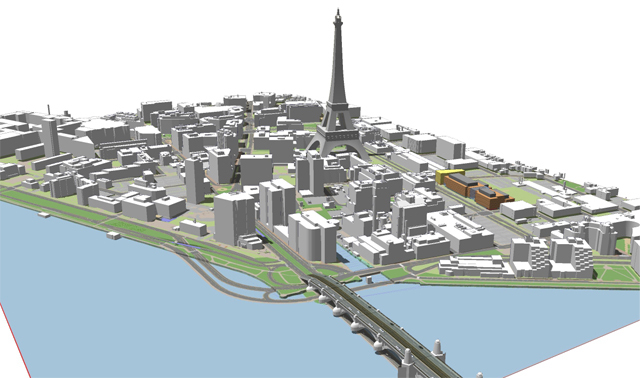 Cities may have different needs but open 3D city models have a global application. When the South African government wanted to redevelop Pretoria’s Tshwane district, various design teams were involved across different projects. Part of the planning constraints was to preserve critical sightlines to important landmarks so knowing what other design teams were planning was essential. As each design for redeveloping the city – from housing and health facilities to business and retail areas – was created, they were integrated into the 3D model to provide a collaborative ‘master plan’ that everyone could work from, which this visual reconstruction shows. This ethos can also be seen in how we’ve developed our collaborative mapping tool. It provides a participatory link between project teams and local communities so the public can share their opinion on plans. Whereas in the past, this stakeholder engagement was based on drawings and ‘town hall’ meetings, a collaborative map is a far more engaging tool, bringing more people into the process to develop plans in a shorter amount of time. Local communities can propose or oppose by attaching their comments to potential developments through the use of online maps. Our city mapping tools are the platform for that collaboration at many levels. From giving designers and planners one coherent view to encouraging technical teams to be more integrated with public perceptions and suggestions. Cities are more than a series of buildings created by individuals. They are hubs that are constantly being evolved by those who share a series of living experiences. We can only shape a better world if we understand the people who live in it and how our work impacts on them.